Your freshly grown mushrooms are in danger as many of the animals are trying to feast on them. They are not well guarded, so you have to stay there and use your skill to fend off any of the hedgehogs, rabbits and even bears. Luckily for you, you are dangerous when wielding a flip flop so they are in for a surprise if they want to steal them. Always try to collect the money they leave behind after being defeated and with them, go ahead and buy new weapons like tennis rackets, frying pans and baseball bats. Use the machine guns you can pick up to deal even more damage. Also you will be able to set many different traps on their paths to gain the edge in this combat. Use the mouse to hit animals, buy upgrades and hold the click to power up your blow. 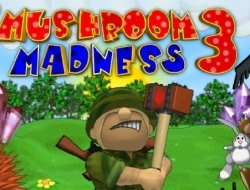 Mushroom Madness 3 0.00 between 0 and 10 based on 0 votes.